Stakeholders within the Portneuf Basin have joined together to form a coalition known as the Portneuf Watershed Partnership (PWP). This group has both a monitoring and outreach-education component, and is a cooperative effort of private industry, educational institutions, scientists, and government agencies at numerous levels (City, County, State, Tribal, and Federal). Support and cooperation for the PWP has been provided by many agencies, listed here. In addition to funds and contributions of labor or materials, many volunteers and property owners have contributed labor or cooperated by providing access to their lands. 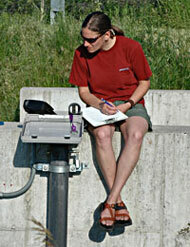 Amanda Rugenski records sensor quality assurance data.